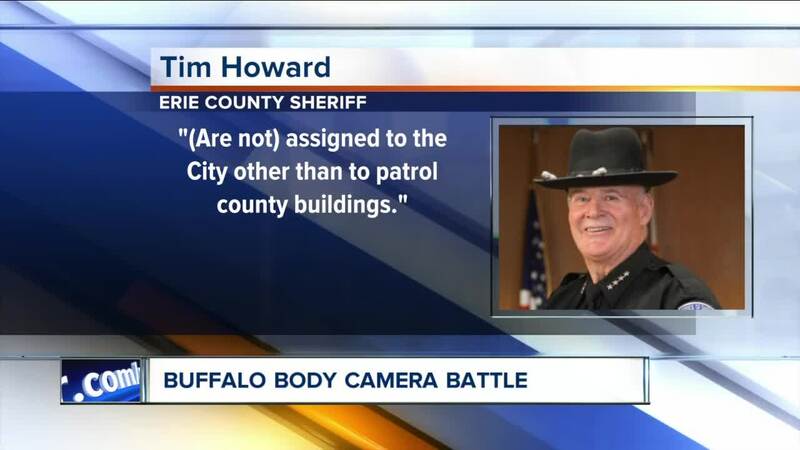 BUFFALO, N.Y. (WKBW) — The City of Buffalo Common Council has asked the Erie County Sheriff's Office to support providing body cameras for the officers in the department. City Council President Darius Pridgen was at the forefront of this, saying this would be a protective measure for not only the public, but the deputies themselves. "This is a way to continue to obtain trust, so that when those officers need information the public feels they can more trust to cooperate" Council President Pridgen said. This comes after the City Council voted unanimously for body cameras on City of Buffalo officers. "The ECSO does not have any Deputies assigned to the City other than to patrol county buildings and properties. Often we have special service members, detectives, and narcotics members working in the city, but if the ECSO had body worn cameras, those individuals would not be assigned the equipment anyway." The Sheriff's office also wondered why they were singled out as the only agency needing body cameras. "The Sheriff is wondering why the common council chose only the ECSO and didn’t include other agencies such as the New York State Police, DEA HSI, EC Probation, NYS Parole, SPCA, FBI, DEA, etc. We hope that this won’t prevent the Buffalo Police Department from contacting the ECSO, or other agencies, to assist with incidents." According to Council President Pridgen, ECSO was chosen due to the fact that they were already testing body cameras.